The vehicles of all 225 parliamentarians purchased using the special duty free permit provided to them is to arrive in the country within three to four months, Ministers Nimal Lansa and Thalatha Athukorale said. 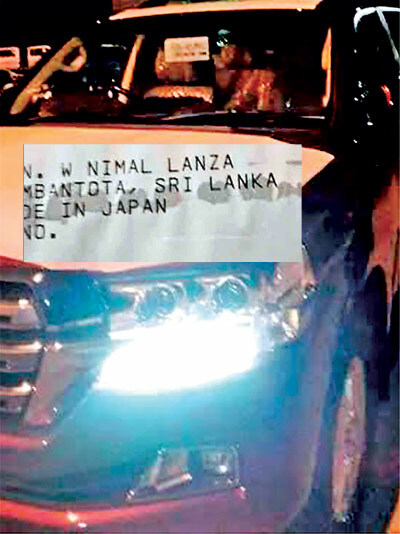 Speaking of the controversy surrounding their vehicle purchases in social media with pictures, Deputy Minister of Home Affairs Nimal Lansa said he had purchased his vehicle, a Toyota V8, at a cost of Rs. 8.5 million. “I did not purchase it through the ministry but through a private car dealer. I used the duty free permit that was provided to me as a parliamentarian to purchase this vehicle,” he said. The Deputy Minister went on to say that he was not the only one who purchased the particular type f vehicle. “Eight others purchased it with me and there are 16 more that will come into the country,” he said. 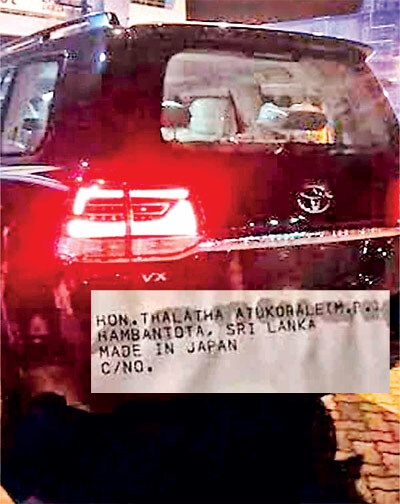 Meanwhile, Minister of Foreign Employment Thalatha Athukorala too confirmed that she too had purchased her vehicle, a Toyota Sahara, with her personal funds and not through her ministry. “I used the permit to buy the vehicle. Some parliamentarians didn’t use their permits as they were waiting for the vehicle prices to increase, so they could bring it down and sell it. I have never done that nor will I ever do so,” she said. The vehicles in her possession were purchased when her brother was a parliamentarian and when she was elected to parliament. “I did not sell any of the vehicles with my permits in 2004 and 2010. I will not do so,” she said. It's amazing how on a parlimentarian's salary they can purchase luxury vehicles! What a timely needed essentials should have given to their partners as well. Dear mrs.Athukorala ! What about the. Ratagiya Attho ? Don't they deserve a car permit ? Every once in two years you charge us 12000/- rupees for what ? Is it a punishment Tax for bringing enormous amount of foreign Exchange to the Government to cover up corruption? We ordinary citizens are the unluckiest people in the world, while lankan politicians are the luckiest in the world. WHAT A PITY TO READ THESE NAME LABEL OF MP WHO NEVER SPOKE DURING ELECTION TIME AS SOON AS THEY COME TO POWER THEY NEED 4WD VEHICLES.WITHOUT HELPING THE COUNTRY MEN FIRST AND FOREMOST THE POLITICIANS FILL THERE ARE STOMACH IN OTHERS WORDS ITS LIKE RAJAPAKSE FAMILY MUSIC NOW THE PRESENT GOVERNMENT SINGING THE MUSIC WITH A DIFFERENT LYRICS.THIS IS REALLY SAD AFFAIRS IN SRI LANKA. for ordinary citizen they have block all the posibilty to buy a car. Please some body slap me hard!!! because i too Vote for this change...and now i realise its just day dream!!! I don't see anything wrong, If they have purchased it from their personal funds. 8.5 Mn for a brand new 2016 Toyota V8!! Shoo! Privileged people ah.. no wonder every man jack wants to get into Diyawannawa! Thank You Mr.Prime Minister. We will pay the tax. May be those MPs dont know that. May be their secretaries have ordered them. If that so please use them for tourist transportation and use the profit to feed the poor. Dear President /PMThis is very bad .first priority to the people who cast their vote. please construct diyagalawatte bokkuwa,which wasn't done for the last one year. People are finding great difficulty to cross the bridge to go Ragama. I find this very eccentric. Not only vehicles they have bought mansions all over the world. We know about our Deputy Ministers who were even unable to purchase a push bike those days.... now !!! Don't worry as usual our PM's term will be only two years. In a way, MR is reasonable. This is way better than selling permits and using department and ministry vehicles. Also pl pay VAT on medical bills, we want to take everything away.. Politicians cheated us yesterday, They are cheating us today and they will cheat us tomorrow. Never to be born in this country again. We need a revolution to take back the country from politicians.